Over thirty years ago, right after we were married, my husband and I hunted morel mushrooms. Until I met my little dumpling, I didn’t even know they existed. We spent hours combing the woods, gingerly bagging each one, and then we lugged the sacks home. After giving them a good soak in saltwater, we fried them in butter. Now we live on acreage of our own, but we haven't hunted mushrooms for the past several years. Well, I didn't have to ask him twice. Like a speeding train, he bolted out the front door. Still in my pajamas, and like the young woman I used to be, I followed him. My husband searched the edge of the woods, while I circled a hickory tree. Empty nut casings lay sprinkled throughout the grass. Thank you, Mr. Squirrel. A gust of wind blew in, and my pajama bottoms flapped against my legs. I smiled. Felt like God himself was breathing on me. 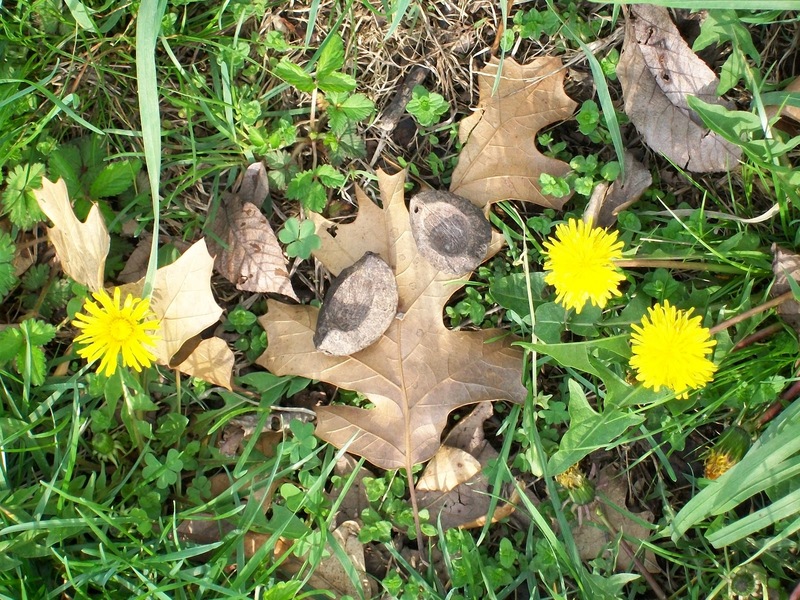 I moved to the next tree, admiring the purple violets, dandelions, and black walnut shells on the ground. I marveled at the brilliant splashes of color, wondering if it didn’t hack God off when we failed to appreciate the beauty He’d created. Why do people poison dandelions? Look at that color. “It’s just a garter snake,” my husband said. I stared at my open-toed house shoes. Although I had thick white socks on, I knew those wouldn’t protect me from a snakebite. Thanks, honey. I feel so much better now. Maybe Mr. Squirrel lingered nearby. The thieving critter could at least cough up an extra hickory nut for Mr. Copperhead. But snakes don’t eat nuts, do they? After poring over the ground a bit longer, and still not finding any mushrooms, we went back inside the house. Yep, blue must be one of God's favorite colors. ﻿Eying my husband, I thought about all we’d done together, how much I loved this man—how much I loved God. Leaning back in my chair, I closed my eyes, savoring the beauty of the moment—the day—my life. Note: Today's post is part of the CW blog chain. The topic is "Savor". Please check out my sidebar, further down on the right, to see some great posts by other writers. Wonderful thoughts and images - thanks Deborah! Wow! Thank you so much for sharing this moment. I felt as if I were there. Thank you for stopping and reading about my moment, Debra. It really does, doesn't it? And it is the little things that bring that quiet joy. Still haven't found any morels, although we've heard others are finding them. Sounds like my favorite kind of day! We like hunting morels too, but we don't have to worry about poisonous snakes up here. Maybe a friendly black bear or two... but no poisonous snakes. Bears aren't so bad. You can't accidentally step on one! Have you found any this year, Pegg? This was beautiful! I love how you rushed outside to join your husband: "Still in my pajamas, and like the young woman I used to be, I followed him." And also, "A gust of wind blew in, and my pajama bottoms flapped against my legs. I smiled. Felt like God himself was breathing on me." I love spontaneity. It seems God does, too. He does not always meet us when we are perfectly quaffed or dressed to the nines. Often, He "breathes on" us when we are in our grubbies or pj's. Just being "regular folks" with open hearts. I agree, Sandi. I think God speaks to us the most when our hearts are open, not caught up in other things. Wonderful story. Very relaxing reading...until the snake slithered in. Then I felt my blood pressure rising. Snakes give me the willies...hate 'em, hate 'em, hate 'em. Fortunately, my wife isn't afraid of them. A true marriage is one of shared responsibility...like dealing with snakes! ;o) Peace and Blessings. Thanks, E.G. So sorry I raised your blood pressure. Like you, I'm not crazy about snakes. However, if one was going after my husband, well, things could get ugly. I envy your sack of morels - especially due to their dearly cost and flavor. I've got a great mushroom soup recipe that calls for them. But I wonder why you just didn't search for black walnuts as they are great as well. What great savoring scents! Thank you, Terrie. I appreciate you sharing your time with me. I've heard they're quite expensive, Chris. I'd love to see your recipe. Thank you for the journey through your back yard. Very lovely. And so full of wildlife, too! Thanks, Carol. I appreciate you stopping in and sharing it with me. Loved your words today Deborah... "my little dumpling" ... cute !! Thanks, Chris. :-) And thank you for stopping by. I find mushrooms to be totally disgusting, but you (almost) make them sound good. LOL I hear you, Mike. Morels are the only kind I actually like. Thanks, Jack. That salad sounds good. Big hug back at you. Great post Deborah, and it sounds like a special day. If we could all savour the moment like you do, we'd be a much happier species. I must say though, you are brave to pick mushrooms. I'd never eat a mushroom that was growing wild because there are too many deadly varieties. I do enjoy mushrooms though, and it would be fun to buy a kit and grow my own. Thanks, Adam. It really was a special day. I'm not so brave when it comes to picking mushrooms. It's just that the morels have a very distinct look. No mistaking them. If someone ever invents a kit for the morels, he/she will be rich. Aww. What a fantastic post! Just the right amount of "savor words", humor, and description. :) Blessings to you and yours. Thanks so much, Nona. I appreciate you taking the time to stop by. Thank you, Traci. I don't know many folks who do savor the slithery creatures.